Make sure your new building or walkway is safe for employees and visitors by installing BOLD STEP® cast abrasive nosings and anchor systems from Sure-Foot Industries at the time of construction. These stair tread systems provide durable, high-quality anti-slip protection, and they are easy to install into freshly poured concrete. Like all of our products, BOLD STEP® systems are made at our production plant in Cleveland, Ohio. These anti-slip solutions help to protect you, your employees and your guests. With safety in mind, we offer an array of anchor systems that complement the appearance of modern structures. Epoxy fillers are available in several different colors, and custom colors are available to provide maximum flexibility in design as well as safety. 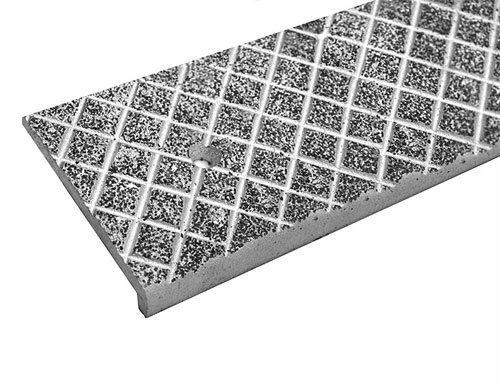 BOLD STEP® cast abrasive nosings are available in either iron or aluminum. 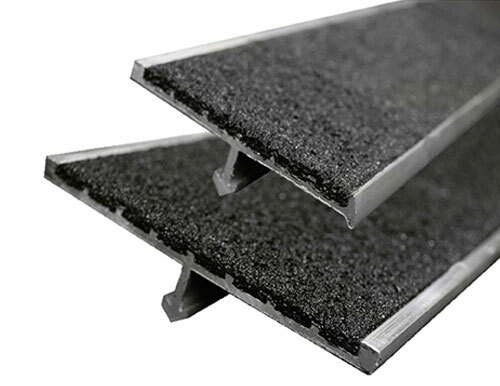 These non-corrosive stair tread nosings are available in either three-foot or four-foot lengths. Durable as well as attractive, our stair nosings are designed to last. Planning ahead always pays off. Don’t wait for an accident to happen before you take safety precautions. Contact us to learn more about BOLD STEP® cast abrasive nosings and anchor systems.